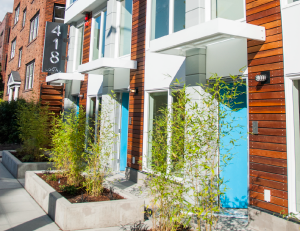 The Local 418 is a brand new apartment building in vibrant Capitol Hill, close to downtown Seattle and South Lake Union. The building is just what the name implies: locally developed, owned and operated. What can we say? We like to keep things close to home. Designed with Seattle sensibility – bright apartments for stereotypical gray days; storage for your suped up bicycle; pet-friendly flooring; green features and built-in shelving are just the start. Capitol Hill is a walkable neighborhood with easy access to downtown and the University of Washington. Whether it’s for work or downtime, you’re able to walk, bike, or ride anywhere around town. Shops, restaurants, galleries; rain or shine there’s always something fun going on here. To view vacancies and apply online, visit InCity Properties.